This split view of the GLMWT drive section and propeller illustrates a dramatic change. Beginning in the spring of 2009, the Glenn L. Martin Wind Tunnel has begun a transformation process. 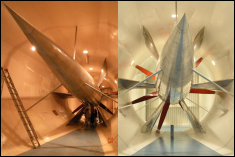 The Glenn L. Martin Wind Tunnel (GLMWT) was built in 1949 through funds provided by the innovative Glenn L. Martin. As a distinguished and dedicated member of the aerospace community, Martin decided that the University of Maryland should have state of the art facilities?hence, the construction of what many know to be building #081. After 60 years as one of the premier low-speed wind tunnel testing facilities, GLMWT has evolved by using the latest testing techniques and brought in high profile clients such as Lockheed Marin, Northrop Grumman, Ford Motor Company, Bell Helicopter, Boeing, and many more private and government organizations who benefit from the use of the unique capabilities of the GLMWT. One area that Director Jewel B. Barlow, Assistant Director Ahmad Kassaee, and Project Engineer Hareen Aparakakankanange are now focusing on is the aesthetic evolution of the tunnel. Over a month-long period the paint in the wind tunnel?s test section was scraped, blasted, and re-painted. The screens in the tunnel have been replaced and in addition other projects to upgrade and improve the wind tunnel?s overall operations are ongoing. The most dramatic changes can be noted in the drive section of the tunnel which houses its massive propeller. Additional upgrades include the current renovation of the lobby area. Outside of the wind tunnel sod and new flowers have been added to freshen the face of the building. Look for more upgrades as the wind tunnel propels forward.